Since our recent post about the fake south side ARA facebook page it has been discovered that the page, which we now control, was in fact a failed plot by Golden Dawn to get information on ARA. The page was ran by a fake individual profile calling themselves “Lesley Papas“. It’s too late, we have everything we need. There’s more within your ranks, including members who show up to a few of your meetings, who have collected information as well. Some supporters of Golden Dawn used to be Marxists or Anarchists, and know the ins and outs of your movement from a few years ago. Within 2 days from seeing this fake profile and alerting people, ARA associates took over the profile and booted their dumb asses from administrating the page. 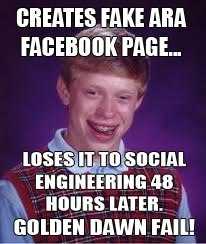 Did they really think they could social engineer us? This major waste of time, as well as their most recent DOX’s that fail to reveal the identity of a single person actually involved in ARA, only show that Golden Dawn are angry, frustrated, and are doing a poor job at intelligence/dissemination. Not to mention the fact that unlike south side ARA, they have absolutely no visible street presence in our city. At this rate, we have seen their technological capabilities and are not impressed. This entry was posted in Golden Dawn, News. Bookmark the permalink.